I made the blue and green scarves! Anyways, I really really like moose and moose designed things. 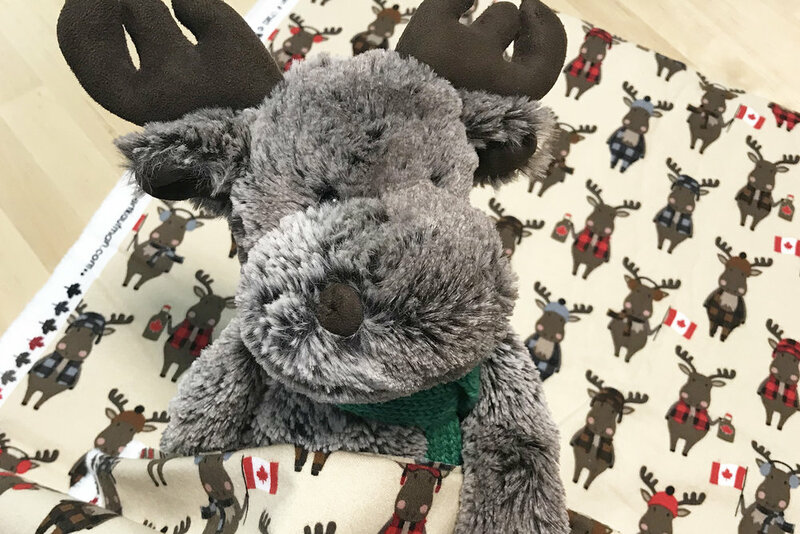 So when I found this moose print fabric, I HAD to get some! 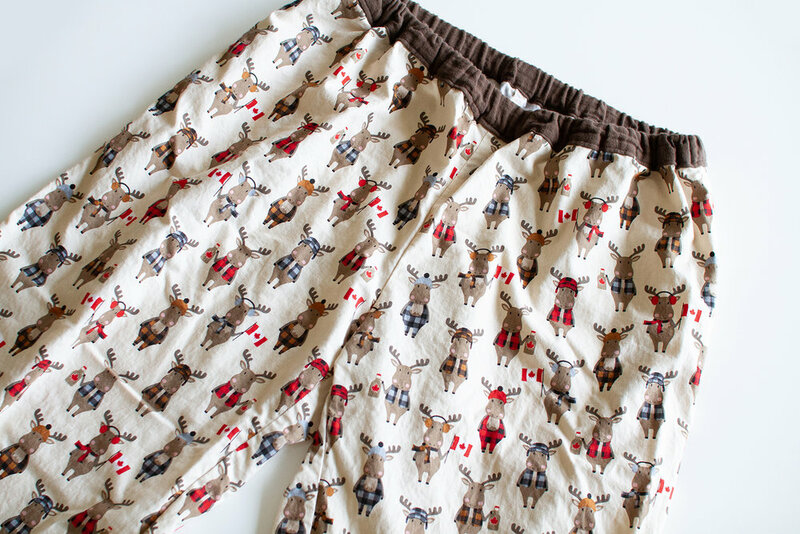 This is “Purely Canadian Eh!” collection and comes in quilting cotton and cotton flannel. How adorable is this?! The style of the illustration is even similar to my moose plushies! Since I like it so much, I bought both cotton quilting and cotton flannel. At first I wasn’t sure what I wanted to make with the flannel…I know flannel PJs would be too hot for me. But then I thought it might be perfect for a robe (house coat)! So I used the cotton flannel for the robe, and the cotton quilting for the PJ pants. I also bought some solid cotton knit fabric to make a t-shirt to go with. For the t-shirt, I modified Coco dress (by Tilly and the Buttons) pattern. I used the top length and made the back slightly longer then the front. I straightened the waist line for a boxy relaxed fit. I also added a neck band and a pocket. The pocket is made with the quilting cotton. A small detail but really helps to make it look like a part of the set! PJ pants are made from the quilting cotton as I mentioned above (The waist band is double gauze, it’s softer on the skin!) They were drafted based on a pair of shorts long time ago but I’m not sure which pattern that was. My dress form doesn’t have legs so it can’t wear pants. I just pinned the pants to the surface, so they look odd but you get the idea. And the most exciting part (for me) is… (drum roll)… a robe! I’ve never owned a robe or a house coat so I was really excited to make one. I used McCall’s M2476 for the robe. M2476 actually comes with top and pants patterns as well. Now that I look at them I wish I tried those patterns this time, maybe next time. This is probably the first time using cotton flannel for me. It’s so soft and not staticky! This robe pattern is pretty simple to put together. The sleeves are wide kimono sleeves which are kind of the opposite of slimming. But it’s comfortable and that’s more important when it comes to a lounge wear! Since I’ve been wearing the robe a lot already, I would really like to make another one. I love this one so much that I don’t want to wear it out too fast! 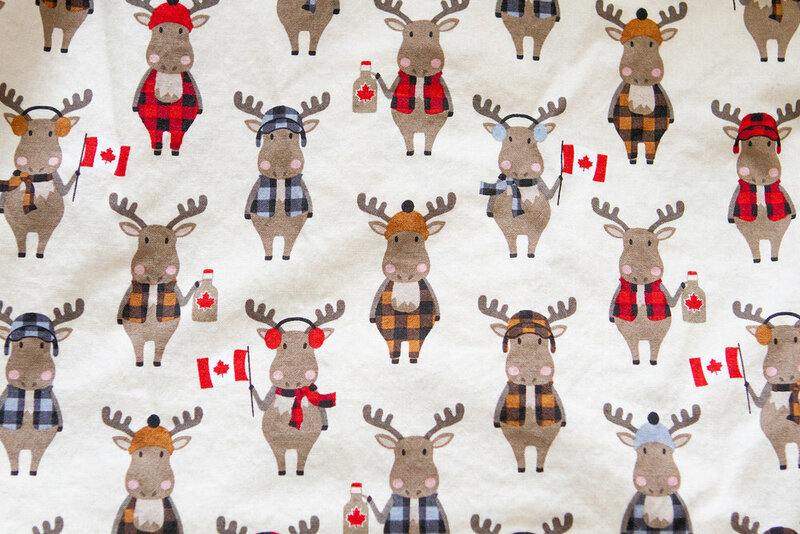 Moose with Canadian flags, moose with maple syrup, moose in vest, moose in onesie… Which moose is your favourite?